Dinner and a show: Swamp Studios’ immersive drama is as light and fluffy as Dishoom’s biryani. Night at the Bombay Roxy, Dishoom Kensington. Photo: Helen Maybanks. Dozens of us are bundled up in hats and scarves, braving the cold outside the Barkers Building in Kensington – not unlike the snaking lines outside Dishoom branches across London, where wait staff often hand out steaming glasses of chai to those hoping to score a walk-in spot at the popular restaurant chain. One of them hands me a manila envelope with my instructions for the night: a night at the Bombay Roxy, a fictional facsimile for Dishoom’s newest branch on Kensington High Street. It takes a stretch of imagination to conjure up a steamy monsoon evening in 1940s Bombay, where the play is set, but a glass of prosecco helps once we’re inside – as does the sumptuous art deco environs, with its dark wood panelling and warm lighting. We’re quickly corralled into a waiting area, glasses in hand, and introduced to the characters inhabiting this jazz club in post-independence Bombay: Cyrus Irani (Vikash Bhai), the suave racketeer trying to make good with his newest establishment, the Bombay Roxy; his musically talented and fiercely loyal partner Ursula (Sophie Khan Levy); a mysterious fresh-faced newcomer Rudy de Souza (Manish Gandhi); two stern policemen, the grizzled Inspector (Harmage Singh Kalirai) and his trigger-happy subordinate Romesh (Raj Aich); and the harried, sharp-tongued general manager Farah (Seema Bowri), acting as the comedic foil to the rest. It’s a bit of Agatha Christie meets Cluedo meets Bollywood, and every archetypal character has either a secret to hide or an unsavoury past. There’s gleeful double-crossing and duplicity around every corner – or as much as can be stuffed into scenes shoehorned between starters, entrees and desserts. Night at the Bombay Roxy is immersive theatre lite for the risk-averse, with few demands for participation and only the gentlest of disorientations when you’re temporarily separated from your party of friends. The mood is convivial and celebratory – as I suppose a real-life restaurant opening should be, supported by a live jazz band – and the crowded, rowdy finale makes up for the thinly-sketched previous scenes, with plenty of action taking place across the dining room floor and the elbow room between tables, much to the delight of some of the tipsier diners. Dishoom Kensington’s ambitious opening conceit is a collaboration with writer-producers Clem Garritty and Ollie Jones of Swamp Studios, and it won’t come as a surprise that the pair have links to Punchdrunk, the company that’s built a reputation and a brand for its immersive theatre – as well as its commercial leanings and shows for corporations including Stella Artois and Louis Vuitton. Swamp Studios has crafted a bespoke ‘Indian noir’ production specially for Dishoom, an idea long germinating in the mind of co-founder Shamil Thakrar, who in turn was inspired by the book Taj Mahal Foxtrot by Naresh Fernandes, a tale of Bombay’s jazz age. It’s a clever marketing gimmick catering to London gourmands in search of an experiential dinner, and the sharing plates, served family-style, overlap nicely with the communal tug of immersive theatre where the audience is all in it together. And it certainly helps to be plied with soft fluffy naan and Dishoom’s signature biryani, lashings of dhal and raita, and spicy mutton with a bit of a kick to get through the winter night. Director Eduard Lewis does his best with a restaurant space, sight lines and a sound system hardly designed with theatre in mind, and it’s hard not to be taken in by the Bombay Roxy and its well-heeled residents despite the thinnest of plots, ridiculous twists and the most overwrought of characters. Night at the Bombay Roxy is an homage to the Irani cafes of Bombay on which the Dishoom aesthetic is based, and a charmingly kitsch narrative that fits in with the brand’s attention to ambience and epicurean storytelling. Don’t expect a meticulous, no-holds-barred site-specific experience, but do expect perfectly affable dinner theatre where the dinner, rather than the theatre, is the star of the show. 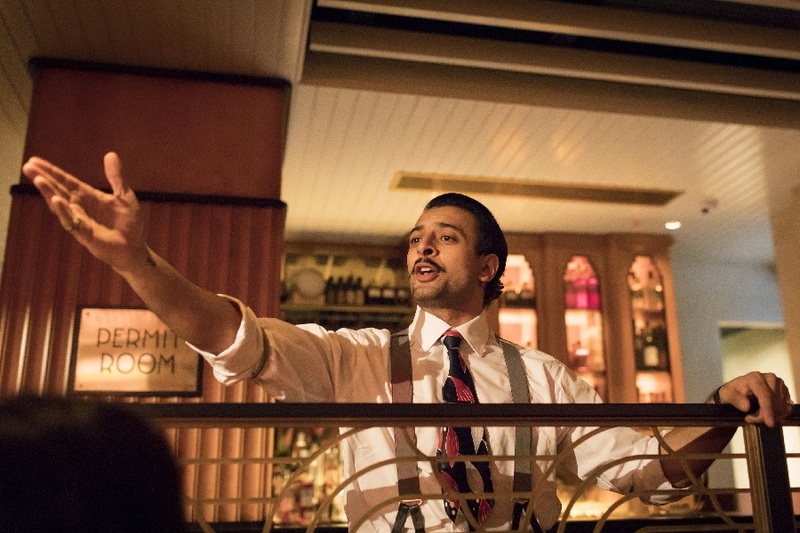 Night at the Bombay Roxy is at Dishoom Kensington until December 14th. For more details, click here.